5 Bedroom Detached Cottage For Sale in Bedford for Guide Price £800,000. "The Cottage" is an impressive and characterful five bedroom detached home, which is located in the popular village of Thurleigh and offers over 2700 sq.ft of living accommodation. "The Cottage" has been improved and extended over the years, the original house dates back to 16th century. The property has in excess of one acre of land and has planning permission to add a double garage with office above. You enter via a large entrance lobby which provides a sink and is used as a utility room. One of the key selling features is the large re-fitted kitchen breakfast room with a peninsula and granite worktops. The lounge is 25ft with a large open feature fireplace and double doors to rear garden. The formal Dining room also has double doors to garden. The fourth reception room is currently being used as a family room but could be used as a study or playroom. The first floor offers five bedrooms and three bathrooms; the master bedroom has stunning views over open field views and an en-suite. Bedrooms two & three both have dual-aspect views. There are two further bedrooms also with field views which are all serviced by the family shower room and family bathroom. 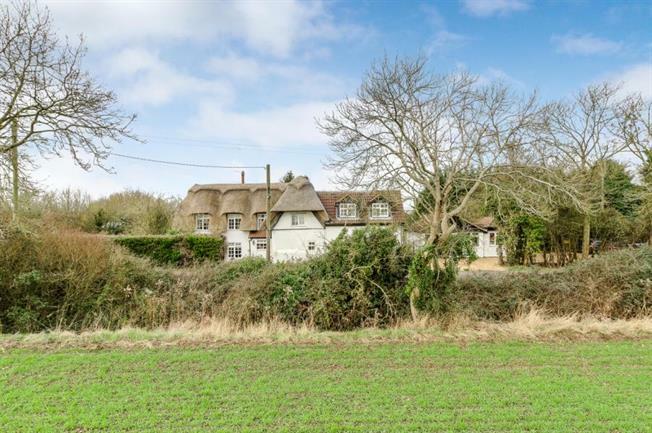 The original part of the home has a thatched roof which has recently been re-thatched and has a 25 year guarantee, with the newer part of the home having a traditional tiled roof. The garden is a very private wrap around garden with mature boarders, small paddock, hot tub, summer house and large sheds. There is an outbuilding to the front which provides garage space, an office and workshop. Thurleigh is located 8 miles north of Bedford and is located perfectly for the sought after Harpur Trust schools in Bedford, Pilgrims Pre-Preparatory, and Sharnbrook academy There are a number of attractions in the surrounding villages including the Bedford autodrome, sporting targets in Riseley and towers health and racquet club in Clapham.